The date is January 9, 2011. That’s the Sunday before the Sinulog. That’s the daybreak when one of the country’s most acclaimed of races will start: the Cebu City Marathon. Yes! It’s the week of the Philippines’ grandest mardi gras. Millions will congregate. Dancers will shuffle their feet. Balikbayans will deluge us. Beer will ooze. Lechons, devoured. Our beloved Sto. Niño, venerated. And, yes, the Cebu Marathon will race along Colon Street, snake beside Magellan’s Cross, meander through the SRP and start and finish at our island’s hub for business, the Asiatown I.T. Park. Isn’t it perfect? Fitting? And very much… Cebu? Racing through our streets… gazing at the colors… of Cebu. What’s brand-new with the Cebu Marathon is this package: New Balance T-shirts. While races hand out singlets to participants, this event won’t be any different—but with a difference: the New Balance running jerseys (Made in the U.S.A.) retail for P950 and will be given for free. This means that, regardless of your category, you’re getting more than your money’s worth. The fees? For the 5K, it’s P500. For the 21K, it’s P600. And for the penultimate and dream-come-true-distance codenamed “42.195” (family-named “Kilometers”), it’s P800. To add to this new from New Balance, all runners—5K, 21K and 42K—will be using RFID timing chips. Yup, no misprint there: while the 5,000-meter participants never previously used timing devices—“They’re just joining the fun run!” the 21K runners will brag—this time, even 5Kers wear the chip. With New Balance, it will be a running T-shirt, not sleeveless. But here’s the “catch:” there are only 4,500 available. Wow, that’s plenty! True. For every-Sunday races, yes, 4,500 sounds unreachable. But, this isn’t your ordinary race. Powered by Globe—who has the topmost billing among the few big-named sponsors—the 01-10-10 marathon had over 4,000 participants. That was nine months ago—before the running boom in Cebu and Manila boomed and boomeranged. And so here’s a suggestion: The registration formally begins tomorrow, Friday. I suggest you sprint (wearing your New Balance!) to the Active Zone of the Ayala Center Cebu and register. This way, you’ll surely be among the first 4,500 to register. Our CCM booth will open from 12 noon until 8 p.m. daily. Ayala Center Cebu, of course, will be a major, major, major partner of this spectacle. The Race Expo, slated the week before Jan. 9, will be held at the Active Zone. (The shirts won’t be available for pickup when you register—but will be ready and brand-new-smelling during the Expo.) Plus, there will be a Pre-Race and Carbo-loading Party on Jan. 7—or two nights before race day. For those who attended last January’s party at The Terraces of Ayala Center, it was invigorating to see runners mingling pre-race tips with fellow runners just hours before the sweat and pain. The Cebu Executive Runners Club (CERC), headed by Jess Taborada—a seven-time marathoner who recently completed the Camsur Intl. Marathon—is behind the CCM. The Cebu City government—like last year—is an essential co-organizer, closing down Osmeña Blvd., the SRP and other thoroughfares to ensure that the No.1 goal of a race is achieved. That’s called safety. And so, the starting gun is cocked, the banners getting printed, the Sinulog drumbeat practiced—all that’s needed is for you to fasten your shoelaces and get your pumping heartbeat to say yes to this once-in-a-lifetime, I-can-finish-a-marathon moment. Ms. Joy Polloso, Ayala Center Cebu’s Division Head…. do we register you as the very first participant for the 42K? Like you, I can’t wait! Good luck. hope the dancers will dance and the drummers will play their drums this time, unlike last year, where they’re just sitting. so its better to have speakers along the race route to energize the runners. Hi John, will there be an option to register online? I would like to be join the race beccuase I will be in Cebu that time. Sir, I suggest having sample shirts at the registration venue to ensure that we choose the right size. One thing I notice among races with different organizers is the disparity in jersey/shirt sizing. Good luck to everyone joining this event! More power to you and CERC! Cerrone: Yes, we hope to have the online registration in a few weeks’ time. Will update you. I live in Washington, DC. Can I register online, and pay by Visa? Please reply promptly, as I would like to get one of the New Balance tshirts! I’m one of the early registrants of this race in the 5K category. May i ask if i could change my registration to 21K ? Is it possible to register online? Or can I make somea arrangement to pay and get my number in Jess restaurant on arrival. 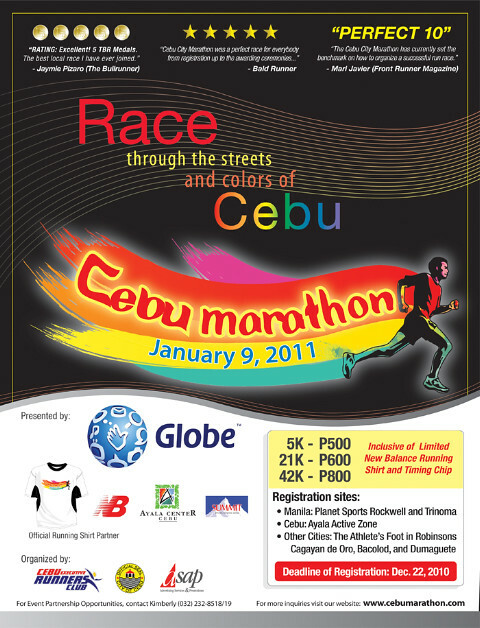 I will arrive Cebu in late afternoon the 8th of january and hope to be able to run (probably 21 k) the next day. 42 k next day ok. gook luck. yes. i am 42 k next day ok. gook luck. The registration page isn’t ready yet as of this time. The payment page doesn’t generate.